In 2003, South African writer J. M. Coetzee was awarded the Nobel Prize in Literature for his riveting portrayals of racial repression, sexual politics, the guises of reason, and the hypocrisy of human beings toward animals and nature. Coetzee was credited with being "a scrupulous doubter, ruthless in his criticism of the cruel rationalism and cosmetic morality of western civilization." The film of his novel Disgrace, starring John Malkovich, brought his challenging ideas to a new audience. 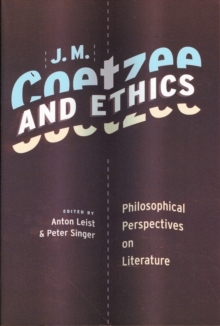 Anton Leist and Peter Singer have assembled an outstanding group of contributors who probe deeply into Coetzee's extensive and extraordinary corpus. They explore his approach to ethical theory and philosophy and pay particular attention to his representation of the human-animal relationship. They also confront Coetzee's depiction of the elementary conditions of life, the origins of morality, the recognition of value in others, the sexual dynamics between men and women, the normality of suppression, and the possibility of equality in postcolonial society. With its wide-ranging consideration of philosophical issues, especially in relation to fiction, this volume stands alone in its extraordinary exchange of ethical and literary inquiry.